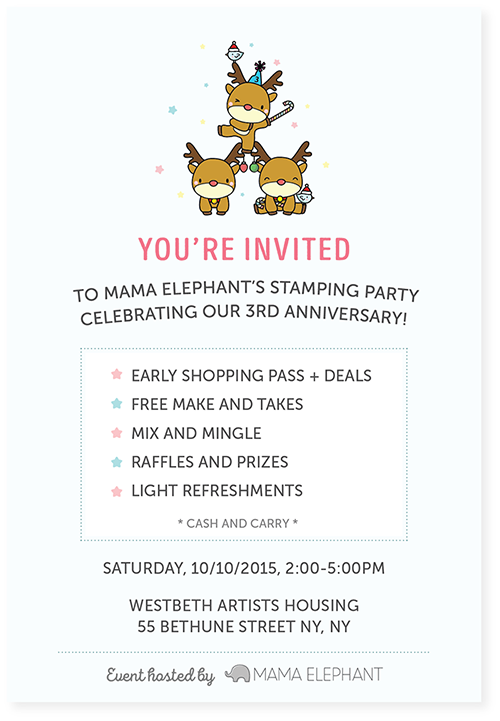 mama elephant | design blog: MAMA ELEPHANT 3RD ANNIVERSARY PARTY! We have a lot of fun things planned for you, starting with this announcement to kick things off! Join us in NYC on Saturday, October 10th for our Anniversary birthday party! It gets better every year with more and more friends coming from near and far to party with us. Check out our flyer/sneak peek of a super duper cute stamp set below! Being an online shop, we really look forward to this event as it gives us the privilege to meet our awesome stamping friends face to face! It's a load of fun and a great way to connect with other crafty friends! Oh, I hear there may be a very special surprise guest joining us! Any guesses? I'll update this post later once someone guesses correctly! Edited to add: Wow, you guys are good! Yes, the super talented and sweet Kathy Racoosin from The Daily Marker will be in attendance! We absolutely adore her here and are thrilled she'll be making the trip out to be with us. Aren't you doubly excited now? Sign up soon, space is limited! If you can't make the event, do not fret! We have an online celebration planned as well with even more special guests joining us throughout October! Watch out and stay connected with us for all the details on Facebook, Instagram, Twitter and of course this blog! Ooh, is it Kathy Racoosin?? That's my guess too that it's Kathy. Too bad it's to far away for me. Can't wait to see everything on-line (wish I could be there, though!)! And you know what... I'm glad you're not having a Release this month - lets me enjoy August's WONDERFUL Release that I'll be getting any day now! Oh My Goodness those Reindeer are adorable!!! Yay!! Happy Birthday, it's going to be quite the party! I so wish I could attend! It's only a few days befor my birthday too! My guess would be Kathy Racoosin! omg is it Kathy?????????? omg seriously???!!!!!! I am so excited! I am going! I was away the last time you had a party but I can go to this one! And Kathy Racoosin would be my guess too. Congrats on your 3rd birthday. I can't wait to see what is the release and if it's anything like these cuties I will be online stalking! hahaha Congrats! YAY!!!! Congrats! I cannot wait! And if Kathy is there....I may cry with excitement! Yay! 3 is a great age! If only I didn't live in the UK! Maybe you'd consider coming over here to meet up with your UK fans who love your stamps via Make The Day Special stamp store. Bring Kathy too - she's inspirational and a lovely person too! Happy Birthday! Congrats on your 3rd Birthday...man how the time flies. I think I will be in huge trouble if the Reindeer are any indication of what is to come. Jennifer McGuire was who came to mind first as your special guest. This looks so awesome! Oh how I wish I could get to NYC for your big event, too, but kids' schedules rule my weekends. Congrats on your 3rd anniversary! I just discovered you this year and I am telling you, it's dangerous knowing you! LOL I need to win the lottery so I can buy more things from you for me and my niece. I live in CT but NY is pretty far for me to go although I would love to be there and meet Kathy. Could you hire a limo to come pick me up? LOL Let's hope I can do something on-line with you. I so need a day away from all the care giving I do at home. Maybe next year. There is a fair chance to win lottery and make your plans come trues. Check oz lotto results to see it for yourself and good luck to you. Wish I could attend and also meet the sweet and talented Kathy in person, but being located in Greece I know that's not going to happen. Looking forward to the celebrations. Looking forward to the next release...sounds amazing! Happy Anniversary! Are those adorable deer going to be part of a stamp set? Oh my!!!! Oh deer, oh deer ;) So excited for your party! Hopping for much success to you Mamma ! Looking forward to it.. Congrats.. Yay! Happy Anniversary! I just signed up to go! I can't wait!! Happy Anniversary. Wish I could be there, but have a great time anyway and lots more years to come. I wish I could fly to NYC to join you! YAY!!!! Tomorrow is the day! I cannot wait!! !